Jacklyn Schneider, an award-winning opera singer, is the artistic director for the Italian Cultural Festival in Bradley Beach Aug. 21. The Bradley Beach Arts Council will host an Italian Cultural Festival on Thurs., Aug. 21 at 7 p.m. at the Banquet Hall Firehouse in Bradley Beach. The free event is the council’s second summer event of the season following its very successful Shakespeare at the Beach, which attracted over 400 guests. Each summer the Arts Council brings education and culture to the community. As part of their vocal concert series, which began in 2011 with “Irish Festivity: A Celebration of Irish Arts,” the council is bringing together a group of professional singers from musical theater and opera to perform Neapolitan songs, opera arias, and poetry readings. “The idea is to celebrate everyone’s own culture and background,” said Julia Sandra Rand, chair of the Arts Council. The evening will feature a “commedia dell’arte” scene from the popular opera aria I Pagliacci by Leoncavallo. The opera premiered at Milan’s Teatro Dal Verme in May 1892 and has been popular with the public ever since, premiering at the Royal Opera House in London and in New York’s Grand Opera House over the years. Council member and artistic director for the performance, Dr. Jacklyn Schneider is bringing together professional singers for the performance. 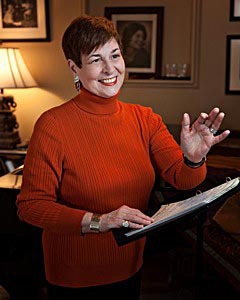 Schneider is an award-winning opera singer, 20-year voice faculty member of American Musical Dramatic Academy (AMDA), and director of AMDA’s American Opera Laboratory where her students have appeared on Broadway, in regional theaters, television, and the concert stage. “Jackie has the access to the singers,” said Rand, who noted that this event would not be possible without Schneider’s dedication and hard work with the singers. Schneider has been rehearsing with New York City based singers and American Musical Dramatic Academy (AMDA) students Breighanna Minnema, Stephen Orr, and Joseph Giudici. Pt. Pleasant based singer Kelsey Robertson will also be performing. Robertson recently graduated with her Masters from Eastman School of Music at the University of Rochester where she was awarded the 2012-2013 Concerto Competition for Mezzo-Soprano. Also from AMDA will be Musical Director of the AMDA American Opera Lab and pianist, Stephen Francis Vasta who will be performing classical Italian songs including the popular Italian folk song O Sole Mio. In addition, Council members Rand and local poet and Avon resident, Bill Barrett, will recite classic Italian poems and sharing the history of Italian opera. The event will culminate with guests learning the traditional Italian Tarantella dance with the help of Anne Beckert and her dancers from A Chance to Dance studio in Belmar. The program will begin at 7 p.m. at the firehouse, 815 Main St. The entrance is in the rear. Admission is free and open to the public and will include Italian food samplings donated by Bradley Beach Italian restaurants. For more information about the Bradley Beach Arts Council visit artsatthebeach.org.